Other than resizing, this image has not been enhanced or altered in any way. It was cropped directly from the image provided by Malin Space Science Systems. In S.E. 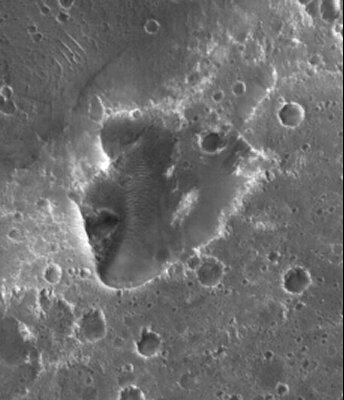 Acidalia, what appears to be a helmeted head, 1.8 km from top to bottom, lies on its side in the ejecta of a large crater. It has been argured that this face-like feature is a depression rather than a raised area. Certain other similar features in the context image do indeed appear to be depressions. If this is the case then the face-like appearance is caused by what could be described as an imprint of a face in the ejecta. In profile, the side of the face appears smooth and dark with respect to the surrounding terrain, it's chin, lips, cheekbone, eye, and helmet arranged in a convincing fashion. The full lips measure approximately 110 meters across. The left eye appears closed to some because of a lash-like line. Others see an open eye with an iris, a dark circle in the middle of a pointed lid aperture. The helmet appears similar to what medieval soldiers wore, the kind with a nasal section covering the bridge of the nose. What could be a chin strap passes beneath the chin. There appears to be an ear hole. The object is at longitude 23.06 deg W and latitude 24.56 deg N. Pixel width is 6.00 meters. This is the entire 3.07 kilometer image width, cropped vertically.